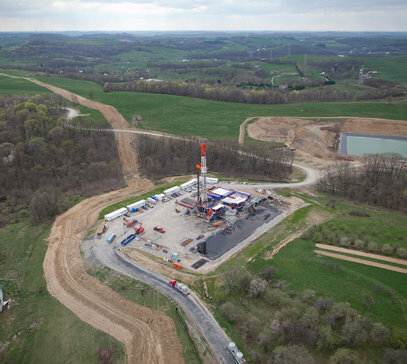 The natural gas and oil in Ohio’s Utica Shale is going to help Chesapeake Energy’s debt-ridden balance sheet — whether Chesapeake is the firm that extracts the fuels or not. Through a listing on the website of Meagher Energy Advisors, Chesapeake has put more than 337,000 acres across 19 eastern Ohio counties up for sale — about one-fourth of the company’s total Utica holdings. More than 80 percent of the land for sale is held-by-production, meaning landowners are locked into current contracts and cannot renegotiate for more money with a new company. Chesapeake said the areas where it is looking to sell are places where its land ownership is less concentrated and company leases aren’t as side-by-side as in other parts of the state. Scattershot public data haven’t stopped Mr. McClendon from extolling the promise of the Utica, continuing a “trust me” line to shareholders while offering little evidence to fact-check those claims. Ohio regulators generally wait months before receiving production reports from Chesapeake, and industry analysts say the company’s sky-high estimates fall back to earth as more information is revealed. This entry was posted in News / Media. Bookmark the permalink.